The O3b Satellite Constellation, provides telecommunications and data backhaul from remote locations, offering low-latency Internet backhaul to emerging markets and developing countries through a series of satellites in equatorial orbits 8,000 Kilometers in altitude. 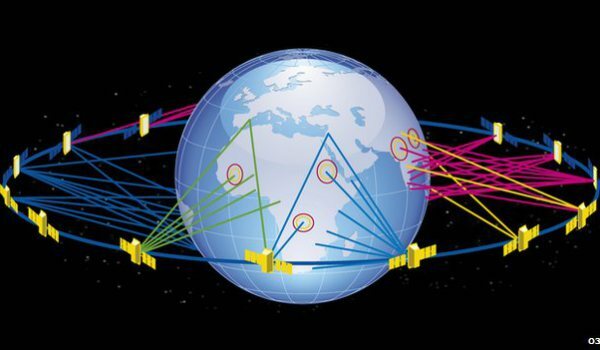 Data speeds of up to 10 Gbps are supported by the each first-generation satellite with a total capacity in excess of 160 Gbps once the initial operational constellation has completed deployment. 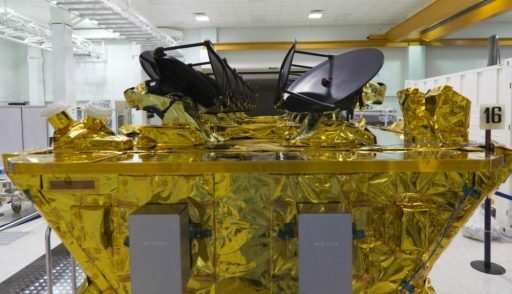 O3b Networks Ltd. is the operator of this new satellite constellation, named after “the Other 3 Billion” – referring to the population of the world that has no access to broadband data services without help. Founded in 2007, the company received financial backing by industry giants like Google and SES during its initial setup toward the first satellite launches before being acquired as a wholly-owned subsidiary of SES in May 2016. The O3b satellite constellation is planned to consist of eight satellites in its initial phase before the number of active spacecraft is doubled to 16. The fleet of satellites orbits the Earth in a circular, equatorial Medium Earth Orbit at an altitude of 8,063 Kilometers. O3b provides fiber-like trunking capacity to telecom operators and backhaul directly to 3G Cellular and WiMAX towers. The first four O3B satellites were launched from the Guiana Space Center by a Soyuz ST-B rocket on June 25, 2013 and entered a commissioning and core system checkout phase before functional checks of their capabilities began as part of a multi-week in-orbit validation campaign. In September 2013, it became clear that transponders installed on the spacecraft were showing an unexpected degradation in their function of providing timing signals required for the downlink of data from the satellites. This prompted the delay of the launch of the second batch of satellites from September 2013 into July 2014 to allow the suspect components to be changed. 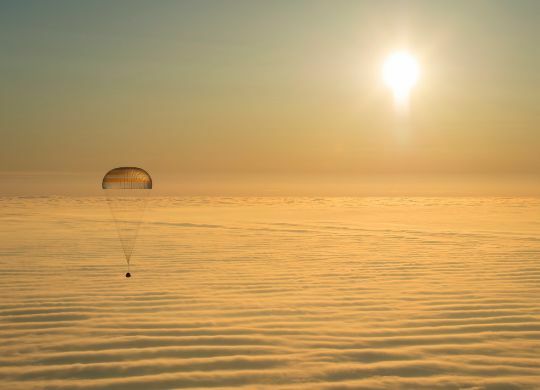 The second set of four satellites launched on July 10, 2014, also atop a Soyuz ST-B and O3b started delivering operational services once their checkout phase was complete. A third set of first-generation satellites lifted off from French Guiana on December 18, 2014 to add further capacity to the constellation which, by that time, had begun providing services to a number of African countries and remote island states as well as the U.S. Government and cruise ships. With 12 satellites in orbit, O3b switched three from the first batch into stand-by mode due to their degraded signal characteristic to serve as viable backups in case any other satellite suffers technical difficulties. By 2016, annual revenue was expected to exceed $100 million and O3b signed additional government contracts with the U.S. to deliver a 365-days-a-year service for a Department of Defence user consisting of a full duplex 155 Mbps link, ground gateway access and a mobile communications terminal with a signal round-trip latency of under 200 ms. 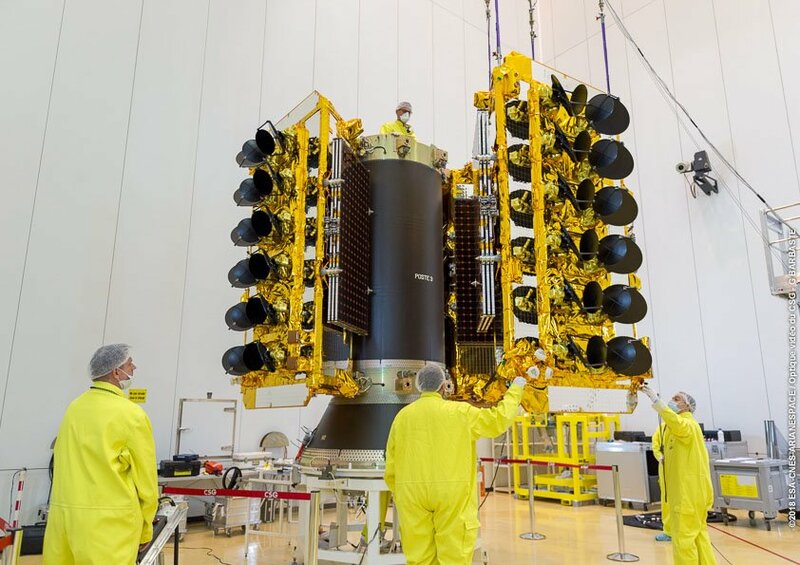 The space segment of the O3b constellation is designed and manufactured by Thales Alenia Space utilizing the ELiTeBus satellite platform that has extensive flight heritage on Low Earth Orbit applications such as the GlobalStar communication satellites. 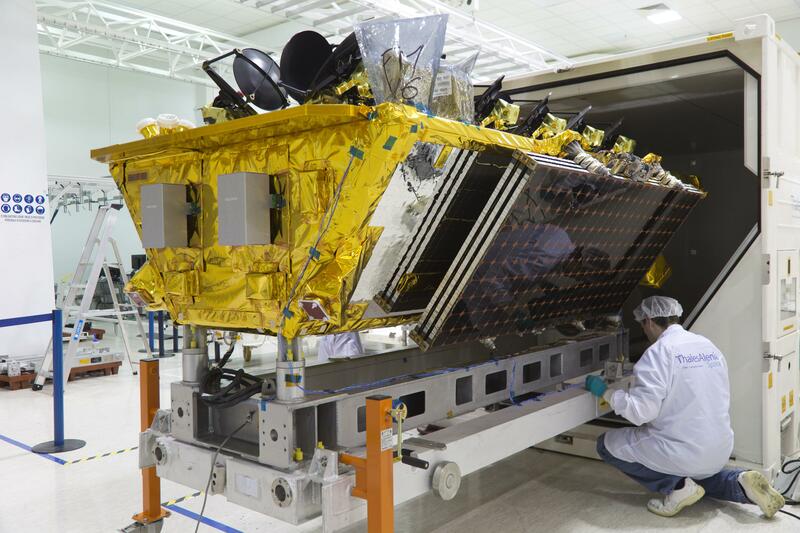 Each O3b Satellite weighs 700 Kilograms at launch with a dry mass of the ELiTeBus of around 450 Kilograms. The satellite bus is trapezoidal in shape, consisting of rigid aluminum honeycomb panels. The spacecraft bus provides all necessary resources to the payload including pointing stability, propulsion capability, a stable power supply and data connections. The platform can accommodate payloads of more than 300 Kilograms that are hosted on an Earth panel that is 3.0 by 1.6 meters in size. The spacecraft features two deployable three-segment solar arrays for power generation via gallium-arsenide solar cells, avionics are used for power distribution and Li-Ion batteries for power storage. The solar arrays are capable of automatic sun-tracking to increase exposure. Beginning of life power is 2,400 watts and EOL (End Of Life) power is about 1,700 watts with a nominal payload power supply of around 1,000 Watts. A 28-Volt main power bus is used on the satellite. 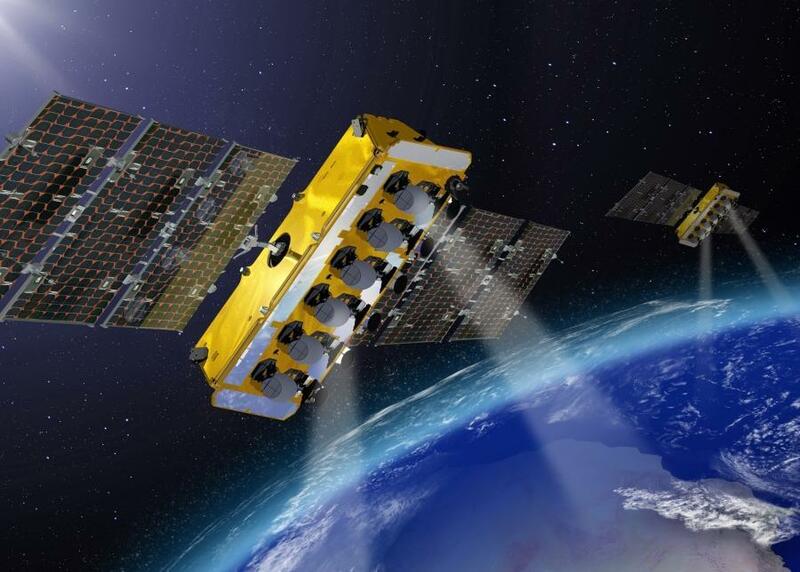 The satellite platform is three-axis stabilized with precise pointing capability using position data provided by Earth sensors as well as fine sun sensors and an inertial measurement unit. A GPS unit provides orbit position information to allow the calculation of pass geometry over the various ground terminals. Stabilization and attitude actuation is accomplished using a combination of reaction wheels and torque rods for momentum management. Overall, the satellite has a pointing knowledge accuracy of 0.007 degrees. Propulsion for attitude maneuvers and orbit adjustments/maintenance is provided by a Hydrazine monopropellant system containing 141kg of fuel that feeds eight 1-Newton thrusters which can be used for attitude control, momentum dumps and orbital adjustments/maintenance. The ELiTe bus is equipped with an onboard computer centered around a LEON3 microprocessor which is widely used in space applications. The OBC system provides command and control of all subsystems of the satellite platform and commands payload operations. A 1553B Data Bus is used aboard the satellite, connecting all systems to the computer and also interfacing with the platform’s communication system that operates in S-Band. 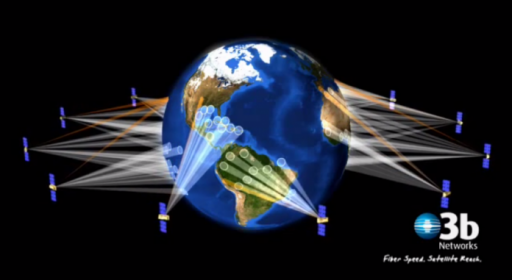 Each of the satellites features redundant systems to prevent single-point failures from causing the loss of a spacecraft. The O3b satellites are built for a design life of ten years. The payload of the spacecraft consists of of a powerful Ka-Band communications system. Twelve fully steerable Ka-Band antenna assemblies are mounted on the Earth-facing deck of the satellite operating at the 4.3 GHz frequency. Two 216 MHz beams are for gateway connections and 10 beams are for remotes terminals. Each antenna provides a data throughput of 1.25 GBit/s – 600 MBit/s for up- and downlink resulting in a total capacity of 12.5 GBit/s per satellite. In late 2015, O3b ordered an additional eight satellites from Thales Alenia Space. O3b FM13 through FM20 are largely similar to their predecessors, but feature some performance enhancements while maintaining overall compatibility to seamlessly integrate within the existing Ka-Band constellation. Each of the antennas can be moved to any point within the satellite’s range within minutes to allow flexible communication session planning in order to provide comm coverage where it is needed when it is needed. 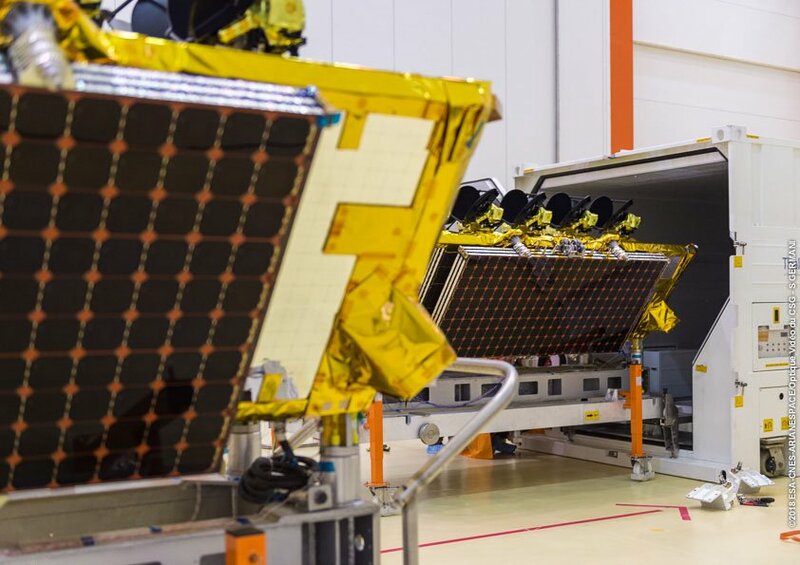 The Ka-Payload uses repeater technology to allow for straightforward allocation of bandwidth in the satellite footprint that is about 700 Kilometers in diameter per beam. The flexible configuration of the system provides the capability of inter-antenna data transfer making it simple to provide simple trunking solutions between two or more points. With the constellation orbiting in MEO, data transfer latency is considerably lower when comparing O3b to Geostationary Communication Satellites that feature latencies of ~500 milliseconds. O3b intends to provide voice communications at a one-way latency of 179 milliseconds and an end-to-end latency for data services of 238ms. For maritime services, a connectivity speed of more than 500 Mbps will be provided. Optimal coverage is provided between 45 degrees north and south latitude, though services can be extended to a latitude of up to 62 degrees.